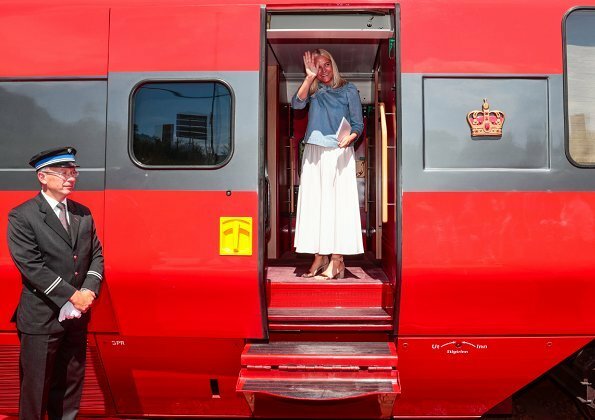 On the second day of Crown Princess Mette-Marit's the 2018 Literary Train tour, the train travelled from Kristiansand to Stavanger, making stops in Egersund, Ogna and Stavanger. 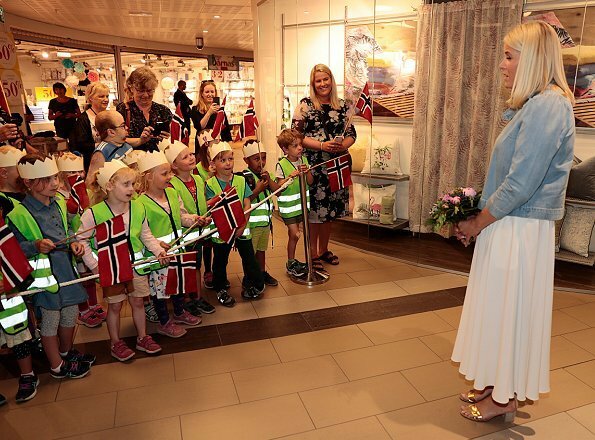 Along the route, the Crown Princess attended literary meetings between authors and the public at the local librarys. 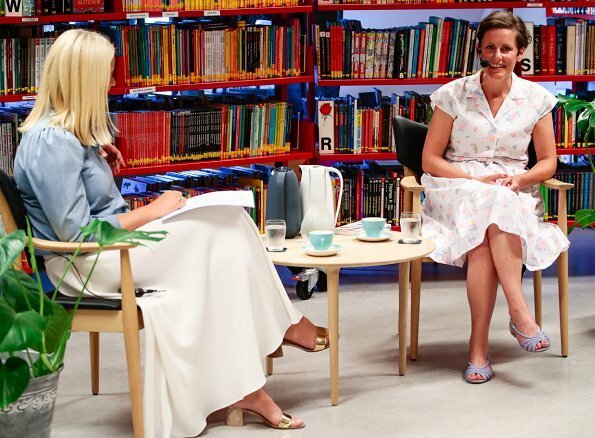 The Crown Princess talked with Author Monica Isakstuen at Egersund library. 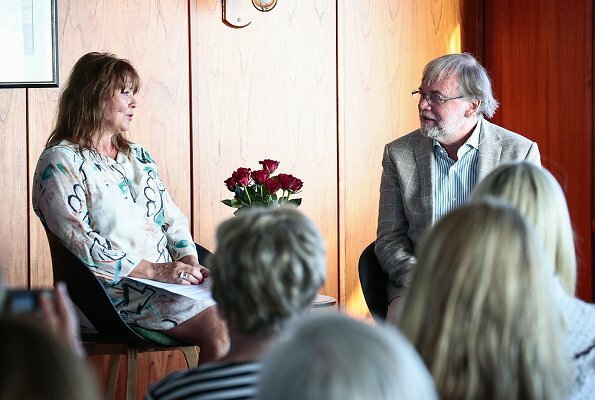 She introduces a literary talk between the authors Helge Torvund and Fredrik Wandrup at the Ogna library. Wish the white skirt was not so long and full. 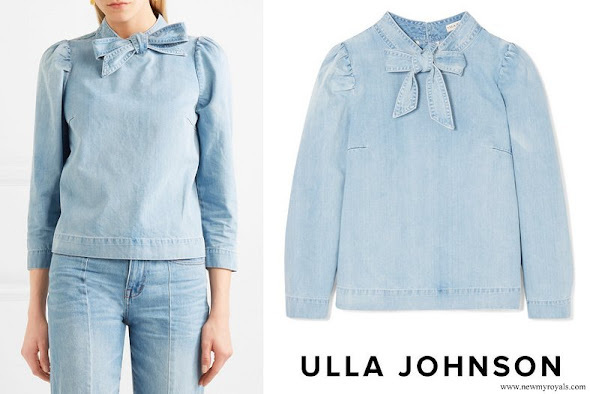 Blue blouse is cute. Shoes are the best part. The white dotted prairie dress in the last pic is just bad all around. Saw more pics of it on another website, so many ruffles, not modern or chic. MM looks very smart with the white skirt and blue jeans blouse the shoes go well with it all. the 2 outfit is really not for her,to many ruffles the dress would be nice on Pss Ingrid but not an adult, why is she trying so hard to look younger? the is no need for it she is a very pretty lady! 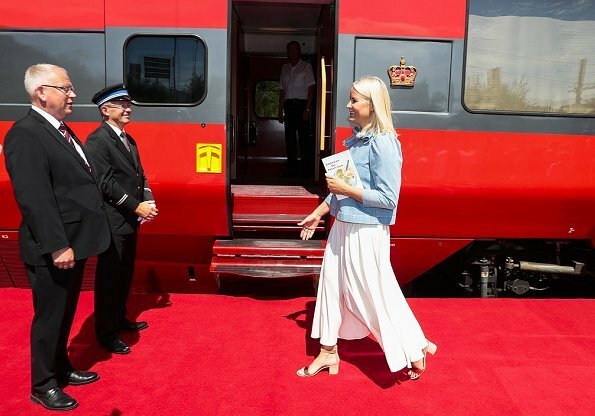 Scroll down to the post of her first day on the train with the casual blue/black/white top and black trousers. New photos have been added there of her in two more dresses and she looks very good in them. I agree. I like he red dress very much. Not a fan of his dress. Well done MM … what a great initiative and way to meet with people! 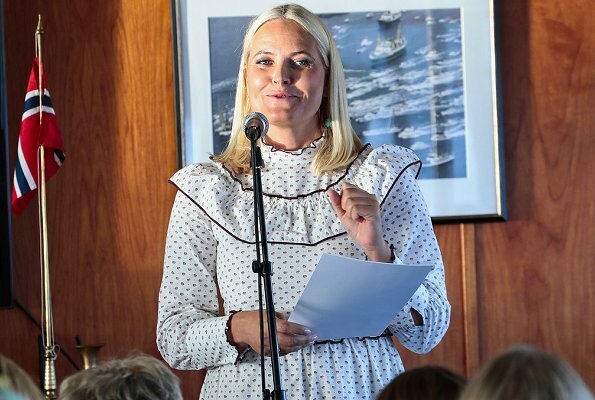 Skirt and blouse are wonderful for Mette Marit, a young and fresh Look. But the white flouncy dress dosn't suit her and she looks so corpulent. No friend of it, sorry. But she is so kind with her warm smile, I love her! 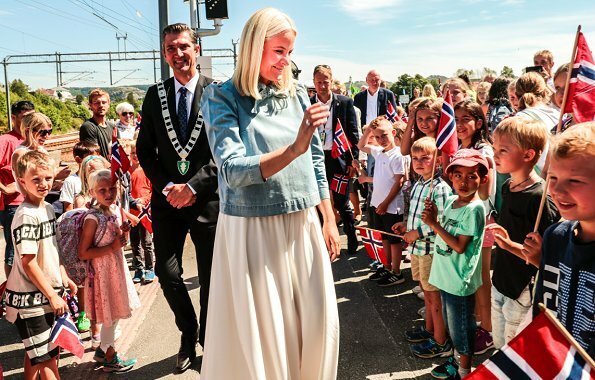 The loose blue top and white skirt are a different look for Mette-Marit, and I quite like it! 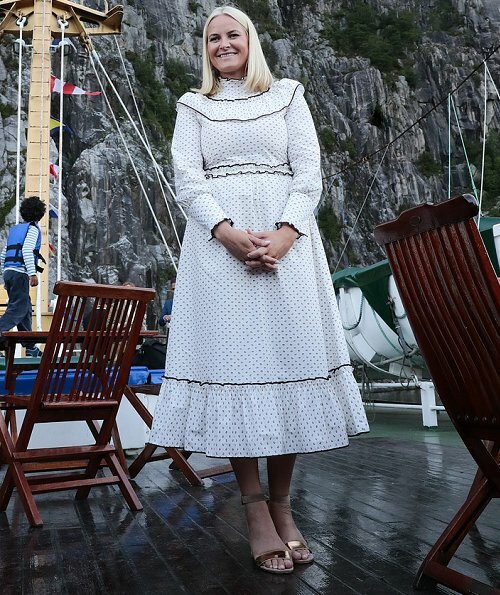 I'm afraid I can't be enthusiastic about the "prairie" dress, though -- I normally like a prairie vibe, but this dress is more like a costume one would wear to a "Wild West Days" festival. There´s nothing here that I like. The first look is a few items randomly thrown together. The second look is an old-fashioned night gown. Her hair entirely uninspired both times. I think she doesn´t care. Her cause is great though. Lets face it, MM loves ruffles and frills in her clothes. She will not change, she is a girly girl so might as well expect it and accept it. She also loves white and actually so do I (on her that is). I personally wore a lot of black in my working days and now that I'm retired it is strictly jeans and tee-shirts for me now.